As many of my close friends and family know, I am a big health nut. I love learning about new healthy techniques to keep my body strong and as free of toxins as possible. Last year my dear friend (she knows I am completely into anything “organic” or “detoxifying”) shared a bit of knowledge she learned from a close buddy. It was about a beverage called Kombucha Tea. Many of you have probably heard of this drink. It has been the latest rage in the natural-living trend encompassing our society the past couple of decades. If you haven’t heard of it, don’t let the name fool you. This beverage is not your typical glass of Lipton tea. Although its origins come from ancient China (research has found that people began making it some 2000 years ago), this “tea” is a result of fermenting a bacterial culture in a brew made of filtered water, sugar and usually a green or black tea blend. But please don’t go into hysterics at the mention of drinking something that is a derivative of bacteria. This particular bacterium is good for your gut! When I first heard of this beverage I drove to my local natural food store and picked up a couple of bottles so I could give it a go. Despite the steep price, I loved it! First off, I used to be a diet soda addict. I craved its tangy sweetness and carbonation. The Kombucha I tried had similar qualities. It was tangy, with just a hint of sweetness on the finish. The tea was also carbonated. Here was a total replacement for the beverage I grudgingly gave up last year. I continued to go to my local health food store and pick up four bottles every week, cringing each time I forked over the money to the sales clerk. I justified the price for all the great health benefits this tangy beverage provided for my body. If you are wondering what the benefits are, you can do a google search and find mutltiple websites for it. That is what I did when I first learned of it, and the more I read the more I knew this drink was something I needed in my daily diet. For starters, Kombucha is considered to be a great probiotic, something we tend to need more and more these days thanks to a lot of the processed foods and chemicals we are willingly (and unwillingly) exposed too. The probiotics keep the digestive track running properly, helping cleanse the body of those nasty toxins swimming around in our gut. Having a healthy gut also helps keep your immune system running better, so you could attribute Kombucha to that as well! Some people claim it has cancer-curing aspects or the B vitamins and detoxifying minerals help cure other diseases. I don’t know if this is true or not, but I figure a little of it in moderation definitely can’t hurt you. So I keep on drinking. 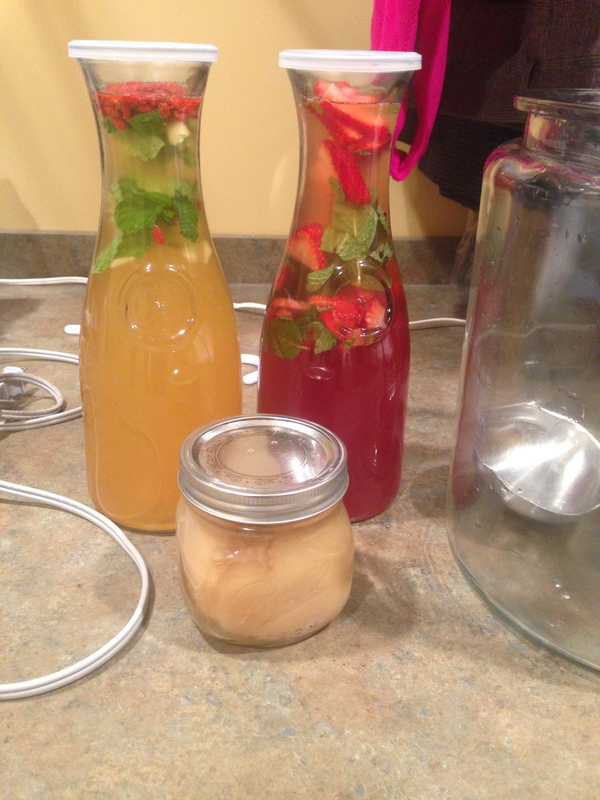 Talking probiotics and fermentation, I bet you are wondering what is really in Kombucha? 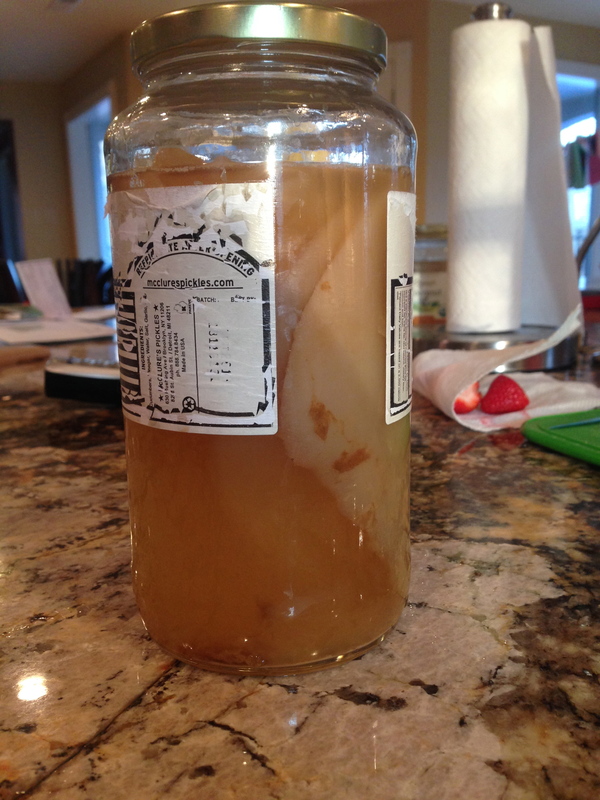 Kombucha Tea comes from fermenting a SCOBY (Symbiotic Culture of Bacteria and Yeast). 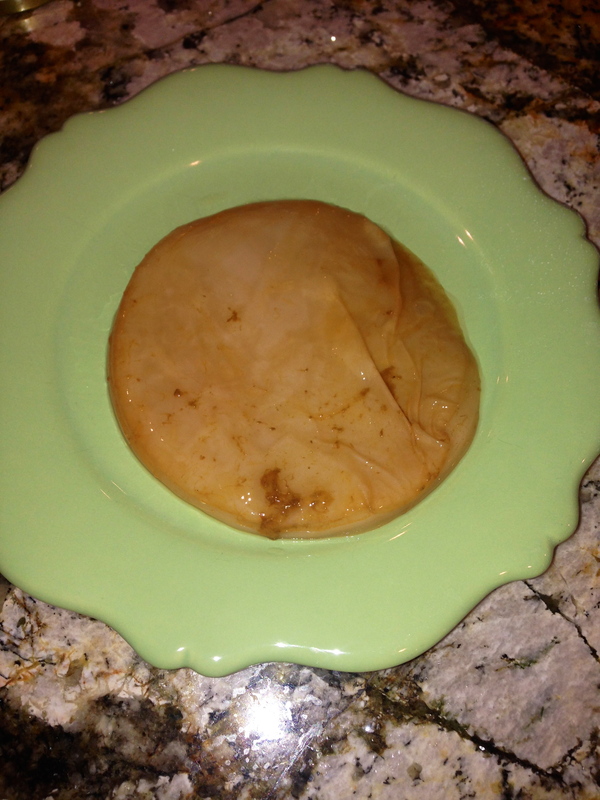 SCOBYs can have many names, such as “mother,” “baby” or just simply “culture.” What you have to be aware of when buying a SCOBY is that the culture is sealed in a sterile environment with its starter liquid (which is just about a cup of Kombucha tea). Don’t drink or make Kombucha from dried or dehydrated SCOBYs, it’s not good eats people. So how does one avoid paying the price (somewhere around $4 a bottle) on a weekly basis when we know this stuff is pretty good for us? Simple, make it at home. Once I did a little research online and talked to a few Kombucha-drinking friends, I realized that I didn’t have to set aside a separate trust fund to keep Kombucha stocked in my fridge. I could just make it myself! It is actually extremely easy to do, and after you get that first batch under your belt and work out your brewing kinks, you too can have Kombucha tea flowing freely in your home. The best web site I have found, based on a friend’s recommendation, has been kombuchakamp.com. This site is owned and operated by Hannah Crum, and she has been brewing Kombucha and educating countless other individuals on the benefits of this drink. Her site is easily navigable and she even has a starter kit for first-time brewers, such as myself. It is what I purchased before I made my first Kombucha brew. Hannah offers lots of great video tutorials if you get stuck on something, and you can even e-mail or call her to get tips. 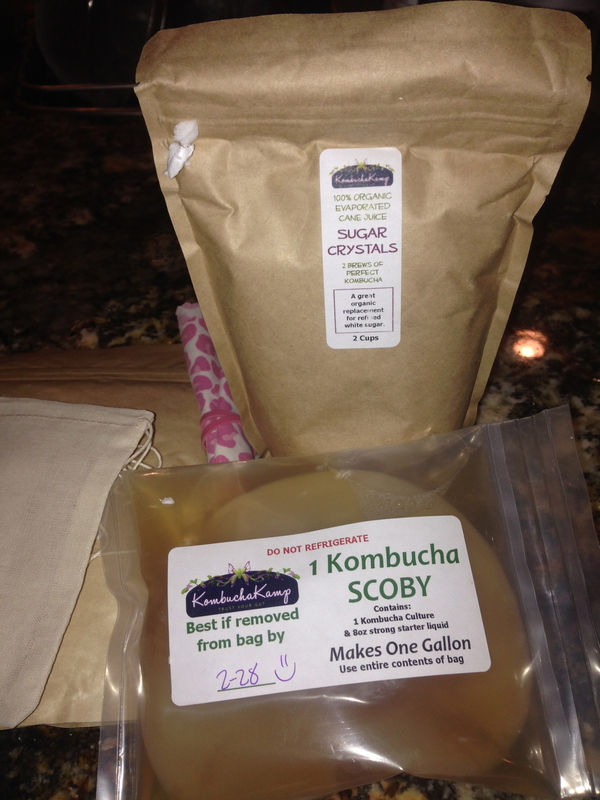 Her SCOBYs are 100% quality product, and she uses all organic tea blends and sugars in her kits. I would definitely recommend visiting this site if you think you want to start making your own Kombucha tea. Make sure you also have a warm, dark place to brew your tea. Laundry room counters or the top of refrigerators are some great places. You just need to be sure the temp is between 70-80 degrees and that airflow is consistent around the jar. It might seem intimidating to think about brewing something that contains bacteria, but really it is very simple and if you follow the guidelines you will be successful. If you haven’t tried Kombucha tea before, go out and buy a bottle to see if you like it. And if you do, then save some hard-earned dollars and make your own at home! You can also flavor your home-made Kombucha. I like to use ginger, mint, fresh strawberries, goji berries, blueberries, even lavender. The world is your oyster when it comes to flavor combinations. Here are my two Kombuchas with ginger/mint/goji berry and POM juice/strawberry/mint. Delish! Now, for your wine tip of the day. Kombucha is a very unique beverage, and its taste and carbonation remind me of one of my absolute favorite wines to drink: Champagne! Champagne can be made exclusively from Chardonnay grapes, or it can also be made with from dark-skinned grapes such as Pinot Noir. Many Champagne wines are a blend of these grapes, which gives vineyards their distinctive flavors. Some will be sweet (Demi-sec or Doux), some semi-dry (Brut) and others will be bone-dry (Extra brut). Depending on your taste for wine, you choose the level of sweet-to-dry ratio. Many people only reserve Champagne for “special occasions,” such as birthdays, graduations or weddings. But I love to just pop open a bottle on a random Wednesday night. Why not? Isn’t life worth celebrating every day? Don’t put Champagne in a separate category that restricts your ability to drink it whenever you want. It can be a great starter wine at parties before you open the heavy-hitter red wines. Or you can have it to go with a light seafood or chicken dish. There are many different kinds of Champagne out there, and lots of different prices. But if you need a go-to label, I would search Roederer Estate. I always keep a bottle of this around my house and it won’t empty your wallet. The flavors are outstanding, much like a Dom Pérignon, but for around $25 a bottle. I can even buy this at my local grocery store. There are many big-name Champagne labels, such as Krug, Bollinger and the aforementioned Dom. But to me, the wine can make just as big a statement without a hefty price tag. So save the Dom for your “special occasion” and open the Roederer Estate to celebrate surviving a Monday.